Historic, moorsy and ever-so slightly Hound of the Baskerville. Muddy settles in for a slap-up Sunday lunch. 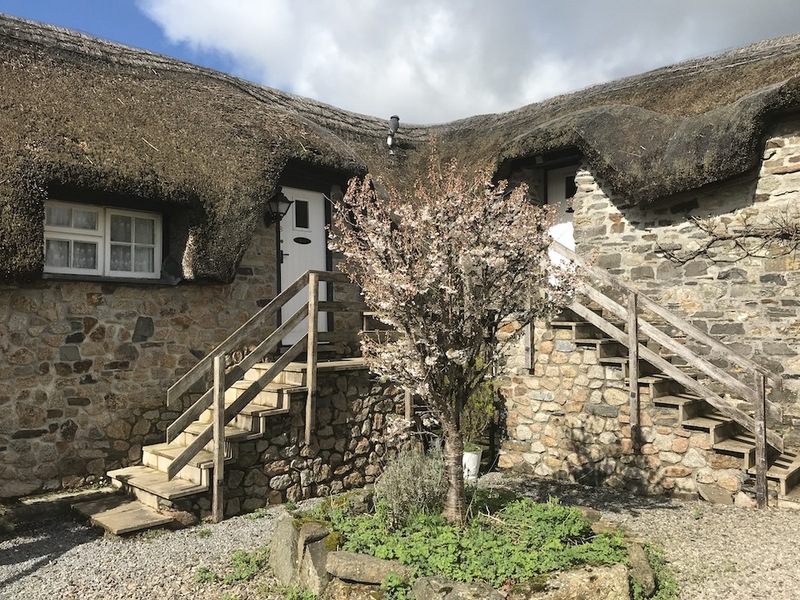 A thatched Devon longhouse dating back to the 13th century, Bearslake Inn hunkers on the north-western edge of Dartmoor National Park in Sourton, with the A386 Tavistock Road to the front and rugged moors behind. 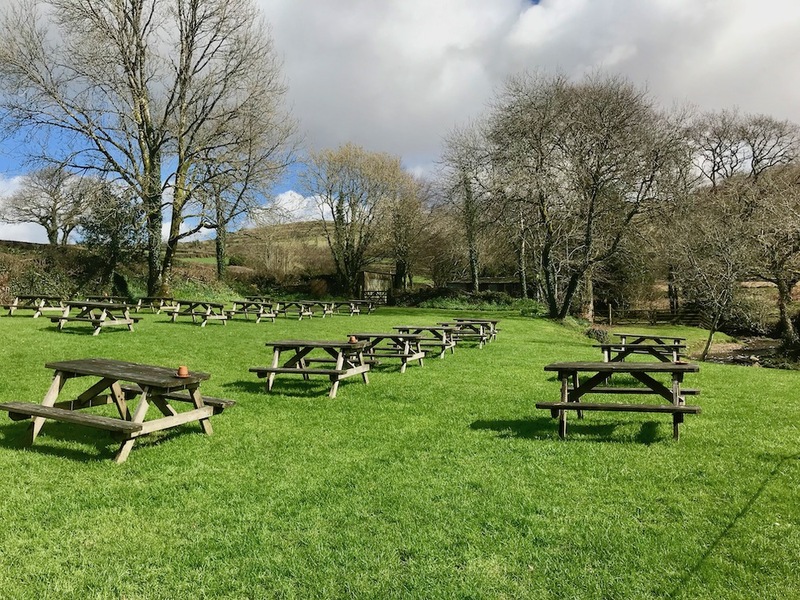 When Mr Muddy and I rocked up for Sunday lunch, there was a family of wooly-hatted walkers fresh from a stomp along the Granite Way waiting for the place to open – always a good sign. 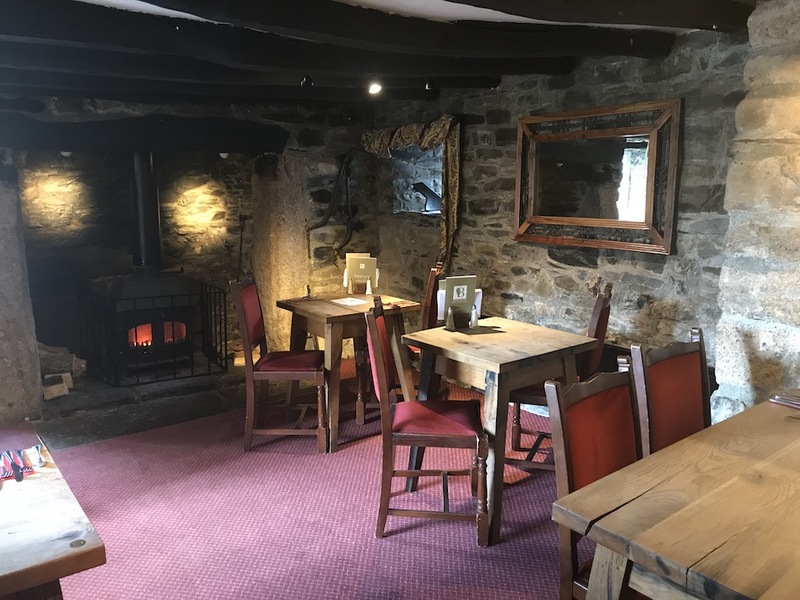 Once a row of farm-workers’ cottages, this AA 4-star inn is now a labyrinth of smaller interconnecting rooms with a stone-flagged bar at the front and a newer open-plan restaurant to the rear, all framed by woodburners, granite walls and low beams (so mind your noddle). If you stay in one of the six family rooms (as charming as Hobbit houses, accessed from the garden), zero light pollution means you can see the Milky Way but not your hand in front of you. 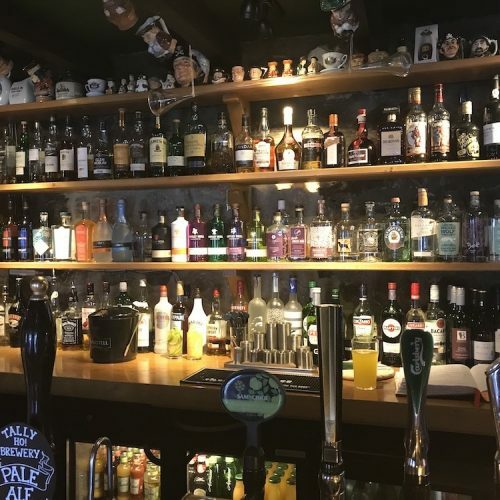 New owners Lisa Jenkins and Julian Tarrant-Boyce have put torches in the rooms so you don’t tumble down the stairs (‘it wasn’t the wine, it was the dark!’) and have lots of plans for new events, weddings and have just extended their Sunday opening hours to 10pm. 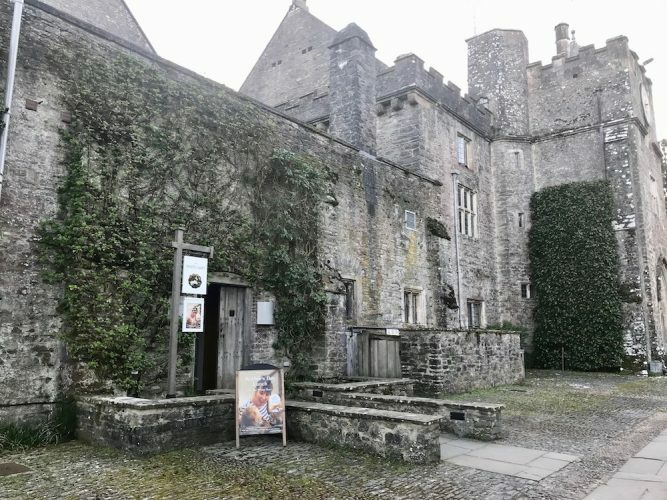 Historic and moorsy, with walls as wiggly as the surrounding hills and hung with faded pictures of 19th century farm-workers. 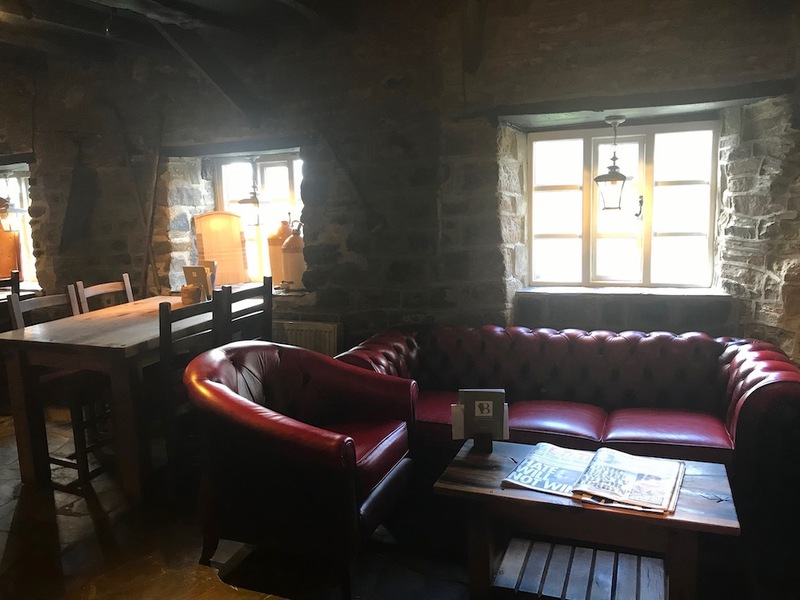 On a moonless night, rumours of a resident ghost (Room 2 just so’s you know) give it a Baskerville vibe so sink into the swanky red leather sofa in the Snug Bar and get your Dutch courage from one of the local Otter Brewery ales, tempting local gins and a choice of four wines by the glass. 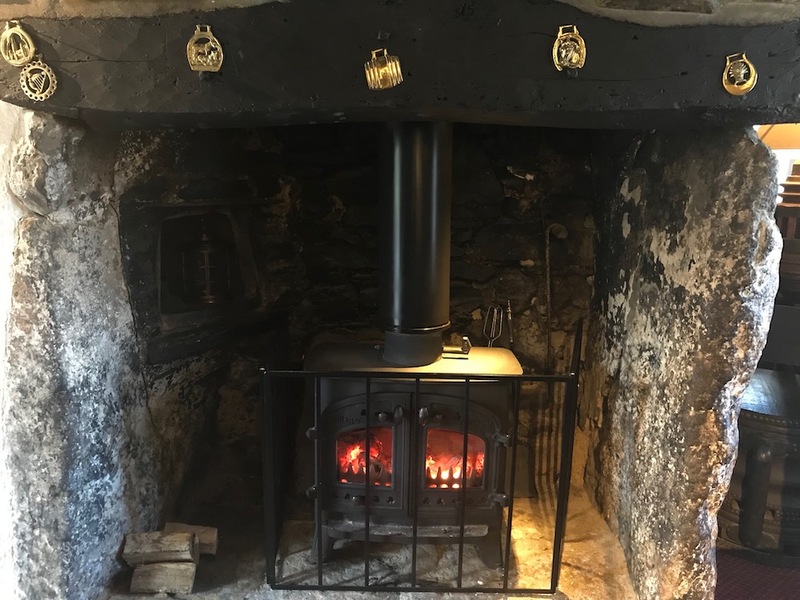 In summer you can sit outside in the beer garden next to a brook and views of wild moors but this being a brisk, daffodilly day in March, we sat next to a warm wood-burner in the cosy Dartmoor Room, which though full of diners (plus a trembly whippet and cocker spaniel) still felt private enough for a tete a tete. 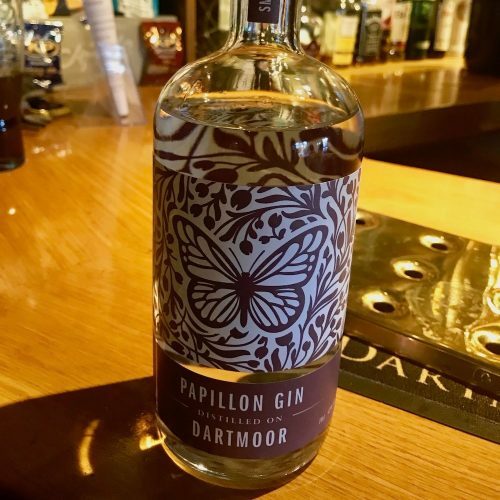 If you’re a when-in-Rome sort, try the new Papillon Gin – it’s a gorsy little number, distilled on Dartmoor with more than the usual feel-good factor as some of the profits go to butterfly conservation. 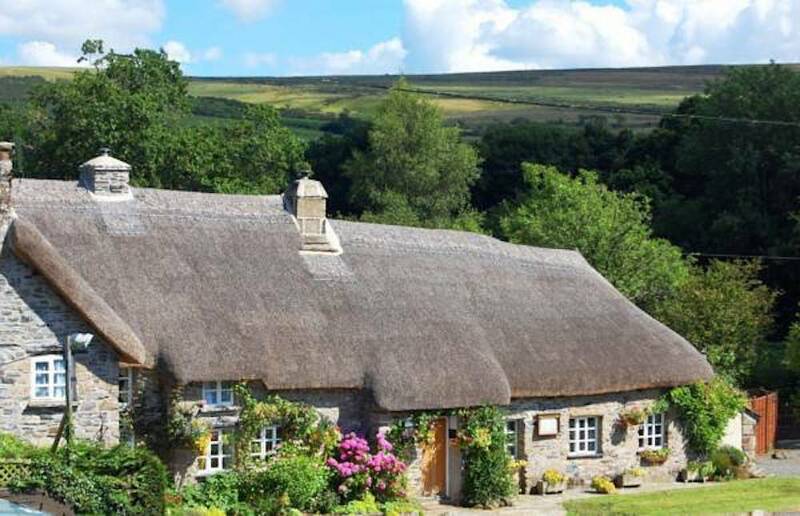 The emphasis is on home-cooked and local, with Devon suppliers as close as nearby Tavistock. 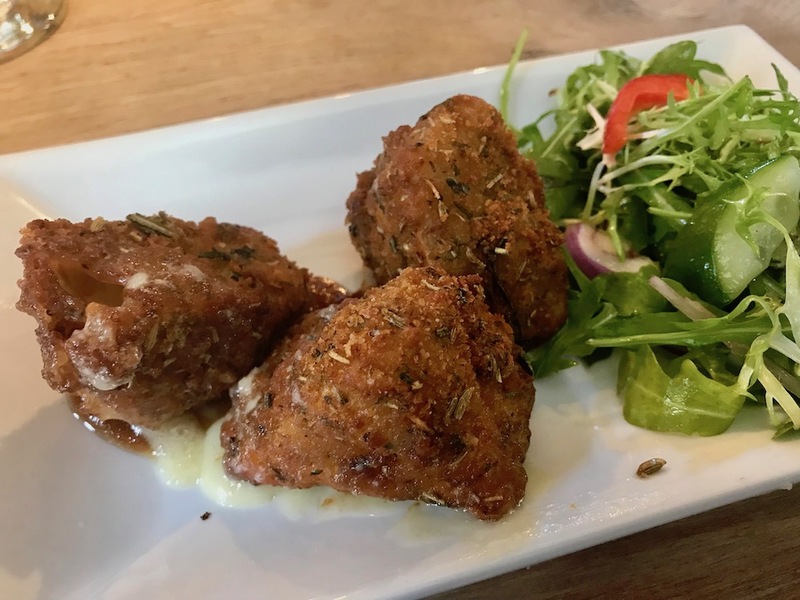 For starters Mr M tucked into crispy battered wedges oozing with brie, with a dressed side salad and a flavourful home-made chutney and I had crab-cakes served on a slab of slate with spicy rocket leaves, fresh onion and pepper. 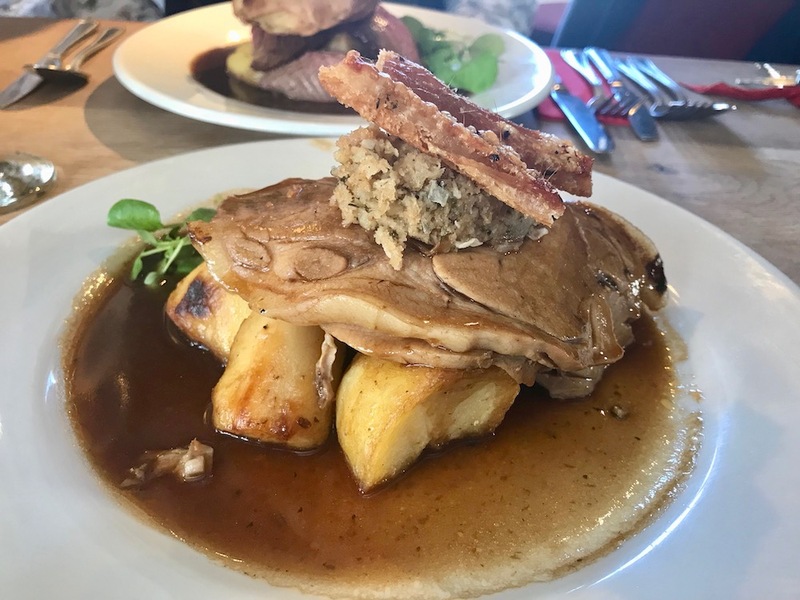 Sunday roast was a choice of juicy pork with crackling, succulent beef with 48-hour gravy and a giant puff of home-made Yorkshire pud and two veggie alternatives, along with a variety of pub classics. There were at least six roast spuds (I lost count) and a parsnip to boot under a jaunty-angled beret of meat topped with soft spicy stuffing and crackling, plus cauliflower cheese and a bowl of veg for sides. 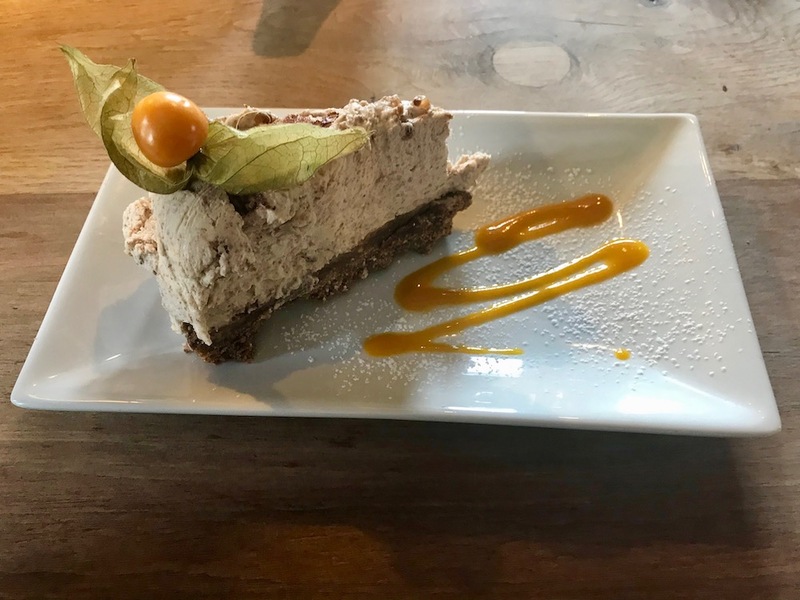 Helpings were so generous when the waiter delivered my creamy wedge of tiramisu cheesecake he actually wished me good luck. 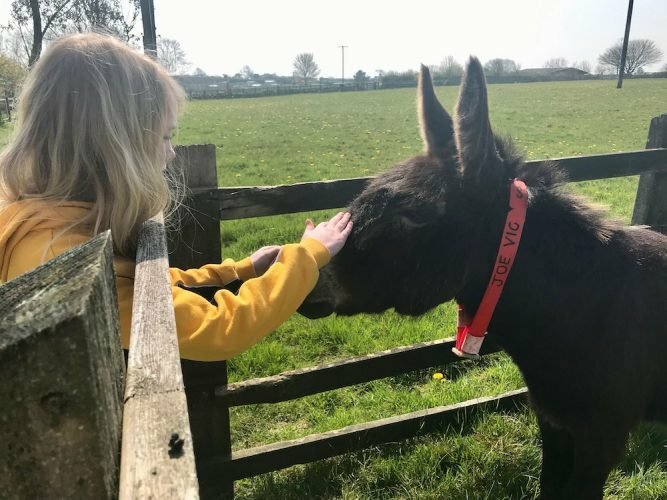 He’d obviously never met a Muddy editor before! 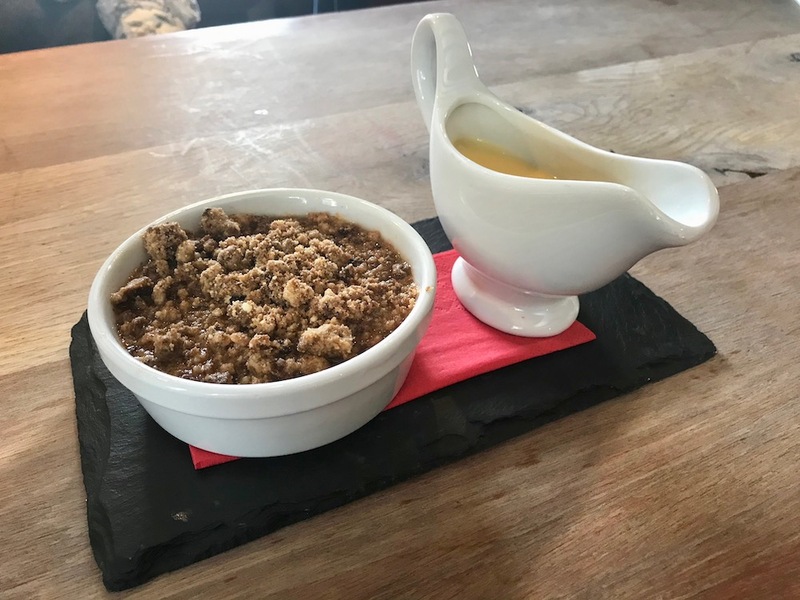 Off it was polished while Mr M spooned down a seasonal pot of a rhubarb crumble with a side jug of gooey vanilla custard – “nice and tart, not too sweet’. There were lots of kids around when we were there, though the compartmentalised layout means you could probably find a quiet child-free corner to hole up in. 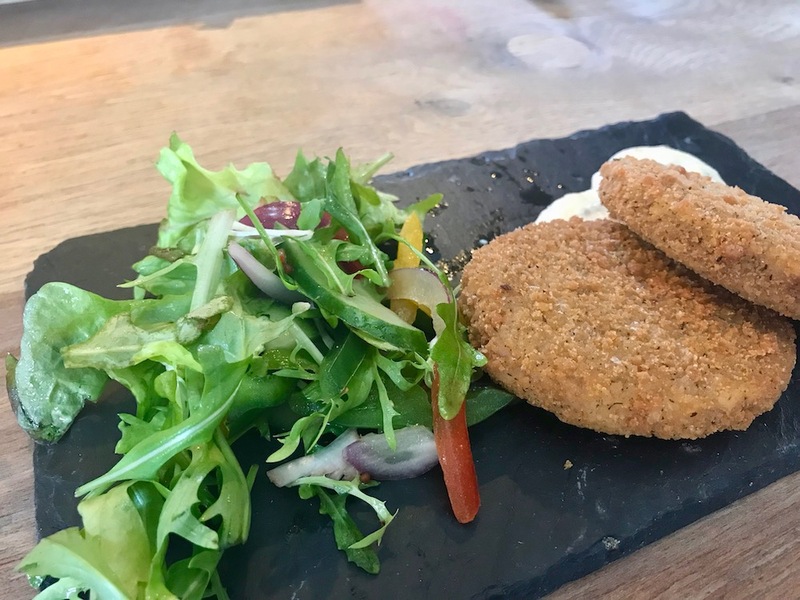 There’s a varied children’s menu and an option on half portions, plus a large flat area of grass to run around on to the left of the patio, though parents with toddlers would need to keep an eye on that brook. And you might want to warn them there are no bears (or lakes for that matter), I checked. 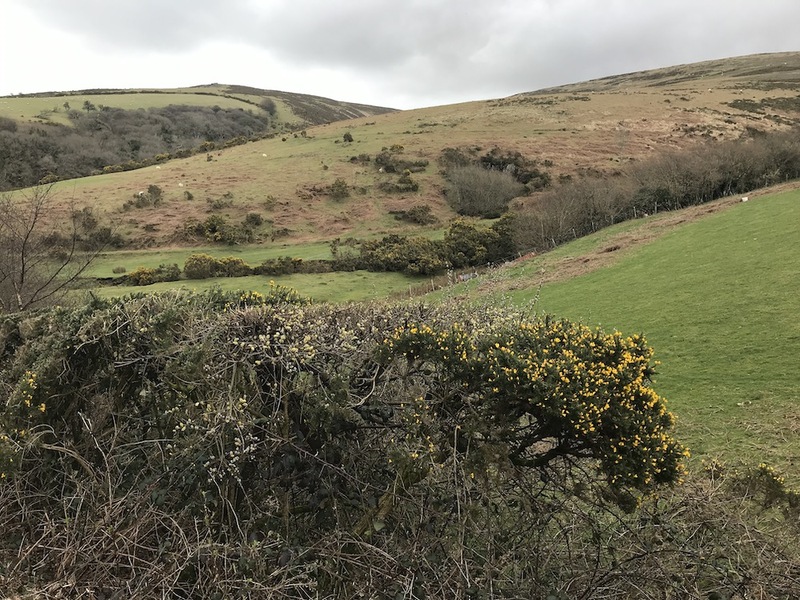 Take your walking boots and wooly hats, there’s a bridleway to the inn’s left-handside which takes you straight onto the 18km stretch of The Granite Way part of the National Cycle Network which runs between Okehampton and Lydford, via historic Meldon Viaduct and breath-taking scenery. 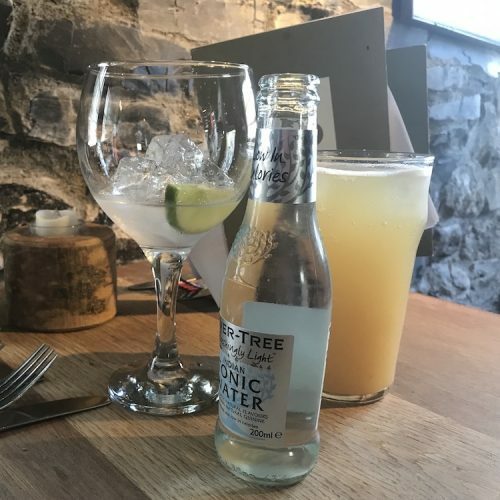 By car, the old wool town of Okehampton is a 10-minute drive away with its authentic Victorian station at Dartmoor Railway or head the other way for Tavistock and its 900 year-old Pannier Market just 12 mins drive away. 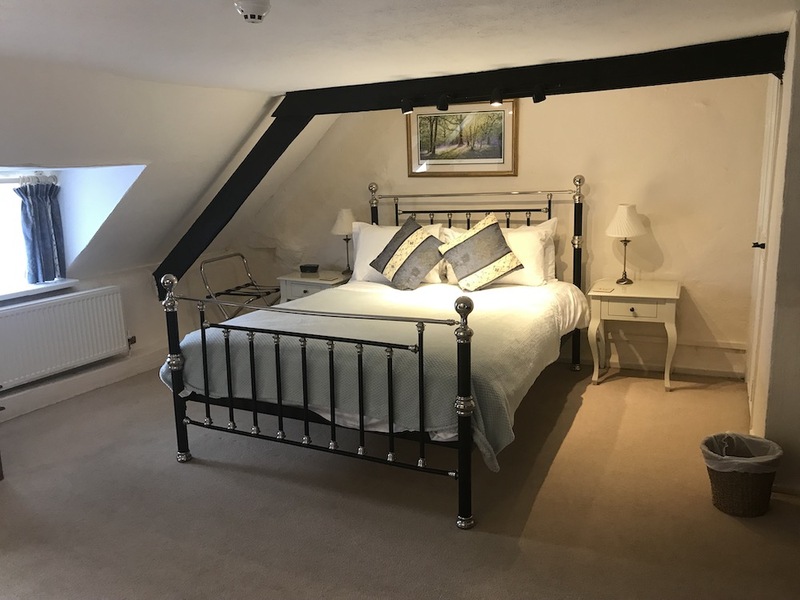 If you stay in one of the six en-suite family rooms, you can hire bikes from Devon cycle hire, or go for a hack with Cholwell Riding Stables 8 miles away near the old Wheal Betsy mine. 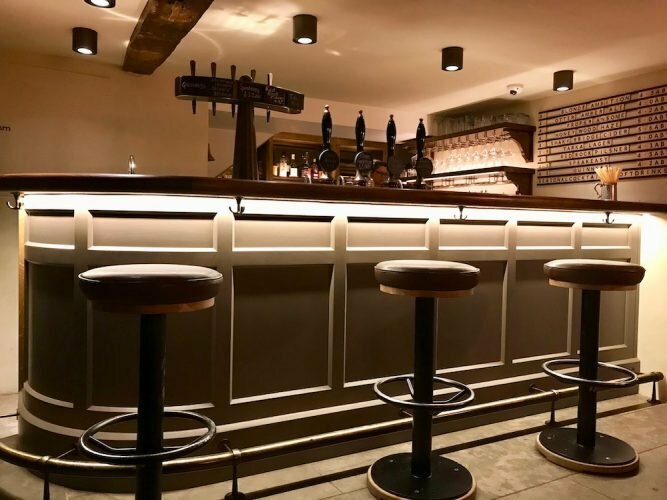 Good for: Family gatherings, loved-up couples, parties, anniversaries, adventurers, walkers and cyclists (there’s secure storage for bikes), dogs (doggy biscuits behind the bar). 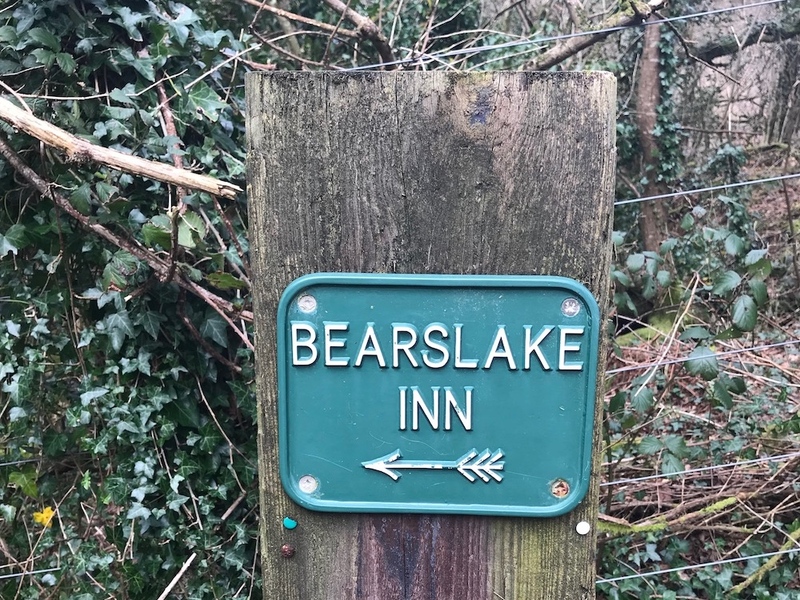 Not for: delicate appetites, it’s hearty rustic food not fine dining; if you’re planning to stay, the rooms aren’t very accessible (except No 5) ; if you get the jitters without mobile reception. 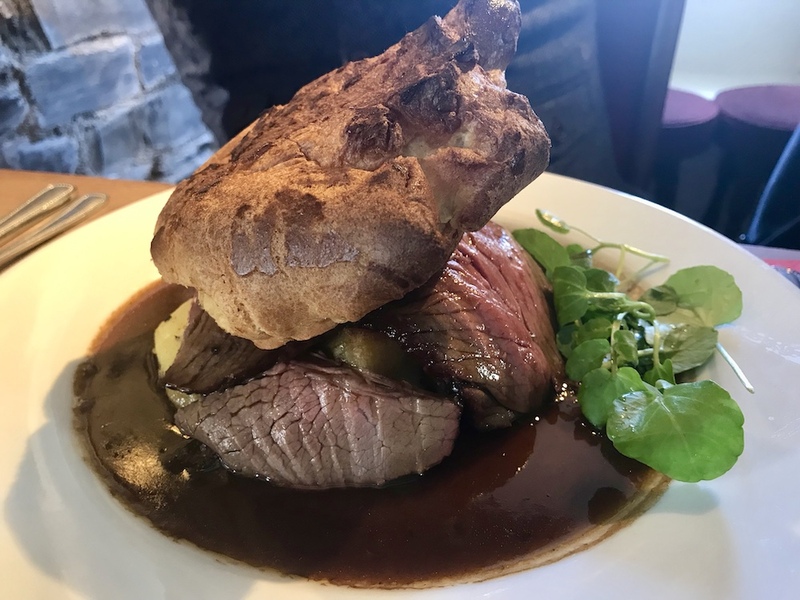 The damage: House wine £3.80; £12-14 for a roast, from £5.95 for dessert. Rooms start at £130.